ALPHA AVIATION STC KIT - CESSNA 100 SERIES FIXED STRAP STYLE (STC SA02211CH). 172, 172A, 172B, 172C, 172D, 172E, 172F, 172G, 172H, 172I, 172K (172F USAF T41A / 172H USAF T41A), P172D. 180, 180A, 180B, 180C, 180D, 180E, 180F, 180G, 180H. 182, 182A, 182B, 182C, 182D, 182E, 182F, 182G, 182H, 182J, 182K, 182L, 182M, 182N, 182P185. 185A, 185B, 185C, 185D, 185E. Stock Colors: Black, Cruiser Grey, and Fawn. Special Order Colors: 80+ colors available by special request. ALSO AVAILABLE: Inertial Reel Style. FAA approved STC / PMA kit for the installation of fixed strap shoulder harnesses in the 2 front seats (pilot and co-pilot) of an aircraft that did not come with factory installed shoulder harnesses. Our Cessna Fixed Strap STC Kit includes all of the required FAA PMA parts and hardware to create the shoulder harness attachment points in the pilot and co-pilot positions as well as TSO-C114 OEM quality AmSafe® 3-point diagonal belt assemblies. STC AUTHORIZATION: Your Model #, Serial # and Tail # are required for the completion of the STC Authorization. 2 (two) shoulder harnesses - pilot and co-pilot position. 2 (two) lap belts with new buckle and end fittings - pilot and co-pilot position. All required parts & hardware for 2 front seats. Detailed installation manual with drawings. Special order Seat Belts are non-returnable & non-refundable. Items that are found to be defective will be either repaired or replaced at the discretion of Alpha Aviation Inc.
Is dedicated to producing products, which meet or exceed the customer's expectations. The purchaser acknowledges that; the products provided by Alpha Aviation inc. The purchaser further acknowledges that; Alpha Aviation inc.. Listing of applications is offered as a guide and the final decision as to the suitability of any product for a specific task is the sole responsibility of the user. The purchaser further acknowledges; that Alpha Aviation inc. Has no control over the products location, user or the expertise of the person using the product. 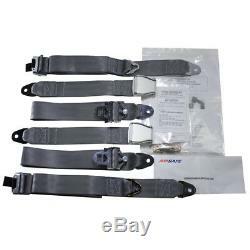 The item "CESSNA FIXED STRAP AIRCRAFT SHOULDER HARNESS & LAP BELT STC KIT 2 FRONT SEATS" is in sale since Monday, May 4, 2009. This item is in the category "eBay Motors\Parts & Accessories\Aviation Parts & Accessories\Parts". The seller is "alphaaviationinc" and is located in Owatonna, Minnesota. This item can be shipped worldwide.